Today, let's chat about Proteins. People who eat non-vegetarian food get their proteins from the animal sources like fish, meat & egg. The sources of protein for vegetarians are pulses or legumes & a few vegetables. 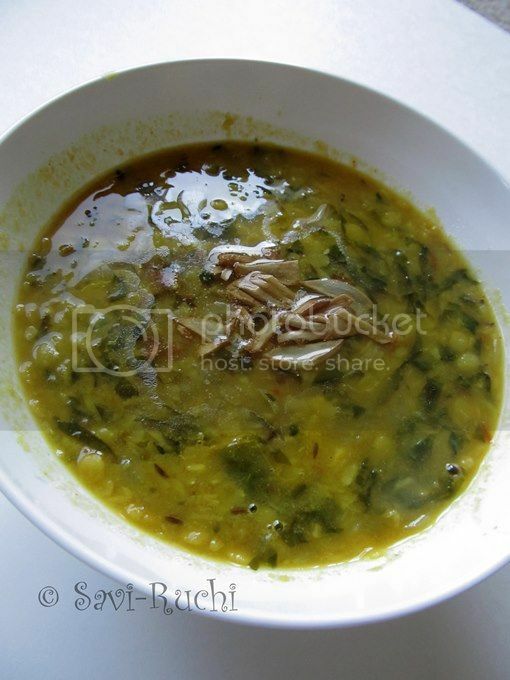 That is the reason, I suppose, dal plays such an important role in Indian cooking. Any dish, which contains both legume and grain, is a complete source of protein. Our ancestors have done an excellent job by carefully selecting ingredients that go into making any dish in such a way that the nutritional value of the dish rises up always. Kudos to them !!! I cook leafy vegetables at least 2-3 times a week. I try to explore simple, tasty & healthier curry recipes. I don’t like adding cardamoms, cinnamon & whole lot of spices in everyday food. I like it to be simple. Given a chance, I even avoid garlic & onions. As ayurveda suggests, garlic, onions & few other vegetables increase the “khrodha, kama & other harmful feelings inside the body”. Hence, it is advised to limit the usage of such vegetables to toddlers, young children & adolescent youth. I strongly believe in them & try to avoid them as much as possible. I suggest everybody cooking for young children to avoid such vegetables once a while to keep them calm & focused. Now, don’t think I have gone nuts. I’m asking you to avoid them & myself preparing dal with loads of garlic. Isn’t it like “do what I say & don’t do what I do”? Note that garlic has umpteen health benefits too. One should not forget that. I feel, we need to know the chemistry of a vegetable to reap the benefits from them. For older people or middle aged people, it works like magic in reducing the bad cholesterol & safe guards the heart. Now that, we know both the advantages & disadvantages of garlic, we can decide when to use them & when not? ?Am I right? Was I clear or did I confuse you guys more? 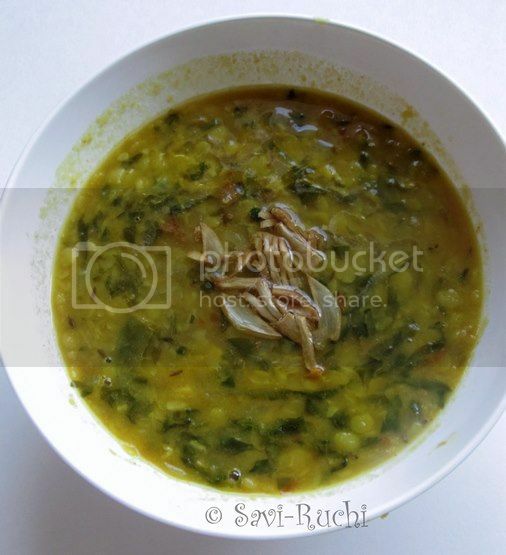 Before I confuse you completely let me come back to..err…., Lasooni Dal Palak. 2 cups finely chopped spinach/palak (I used frozen palak). Mix both the dals & wash them in running water two or three times. Add 1 cup water, chopped green chilli & turmeric to the washed dal. Pressure cook for 2-3 whistles. Allow the dal to cool. Meantime, fry the sliced garlic pods in ghee until golden brown. Remove them & drain them on absorbent paper. Prepare the tempering/tadka by using the same ghee (used for frying the garlic). When ghee is hot, add cumin seeds. When cumin seeds splutter add minced garlic & onions. Sauté till onion turns golden brown. Add the finely chopped spinach/palak, red chilli powder & cook the spinach for 3-4minutes. Follow spinach by finely chopped tomatoes & cook the tomatoes for 2-3minutes. Mash the cooked dal gently & pour it to the pan. Add ½ cup of water, salt & mix well. Boil the dal for 3-5minutes on a slow flame. Turn off the flame, add lemon juice. Mix well. 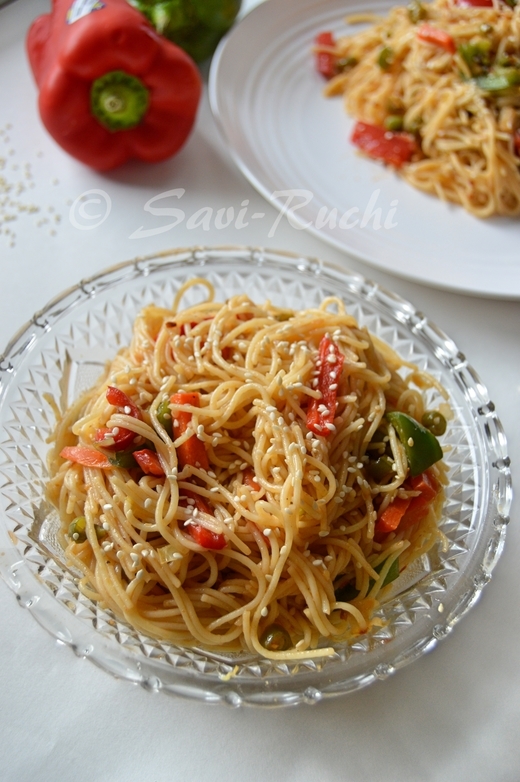 Garnish it with the fried garlic & serve it hot with rice or rotis. I make this very often, but I don't add lemon juice. Thanks Ashakka. I saw your version today, will surely try next time & let you know. Even I add garlic to normal dal tadka sometimes. Ha Ha Ha.., nice trick. I am happy that my hubby never complains about garlic. Ditto is the case with my parents. They dont eat garlic. 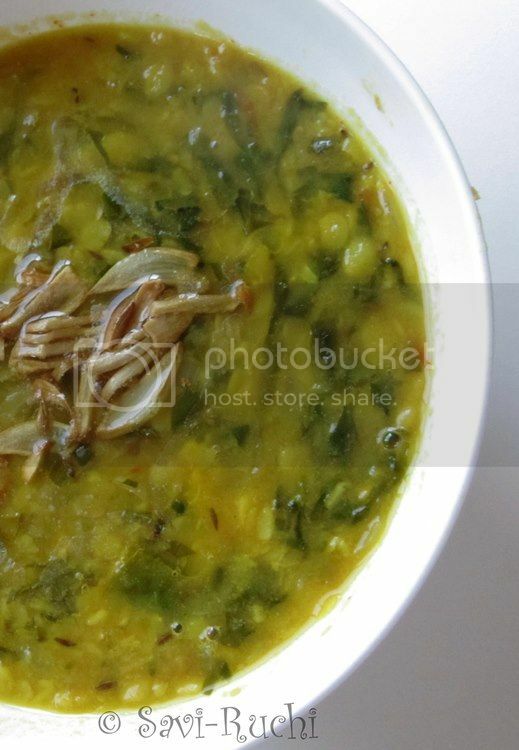 Liked your version of dal palak. howda? namma maneli normal soppina hulige garlic hakalla, but I agree to the fact that garlic adds a nice flavor to leafy vegetables.